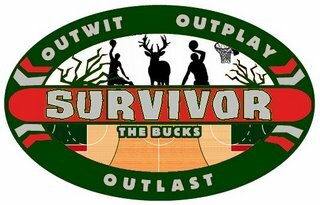 Bucks Survivor: Week Four ~ The Bucky Channel - The World of Sports from Wisconsin's Perspective. The next round begins now, and we'll move the voting to last until Friday. Remember, you can vote in the poll at the right hand side of the blog. Vote for the Bucks player who you would like to see get kicked off of the team before any other. Things have been going pretty much to script so far, although there are a few people that seem to have an agenda to vote Brandon Jennings out right away, which I find interesting.